I am not going to write too much about the technical details, since this is more of a comparison post. 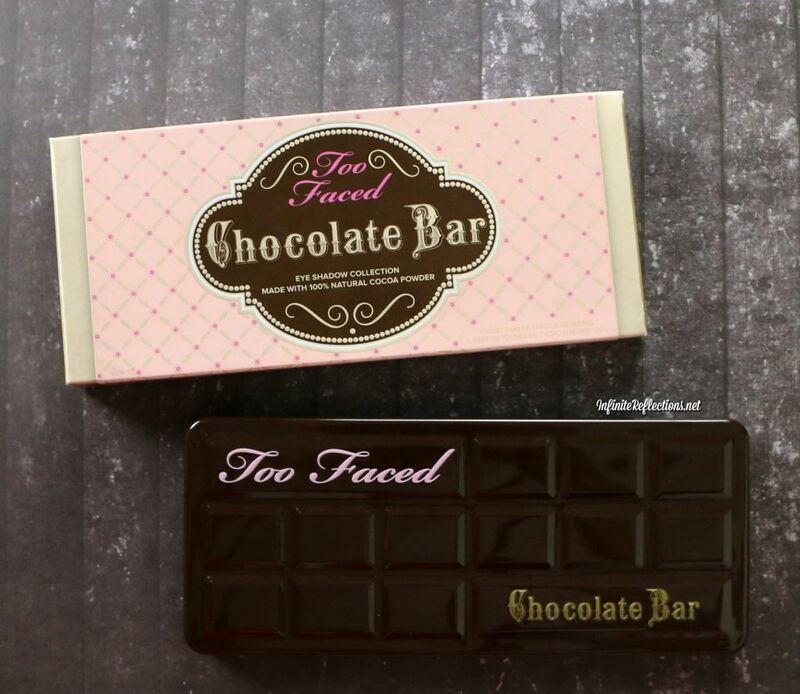 But in a nutshell, the two palettes have pretty much similar packaging and you get the same amout of product. 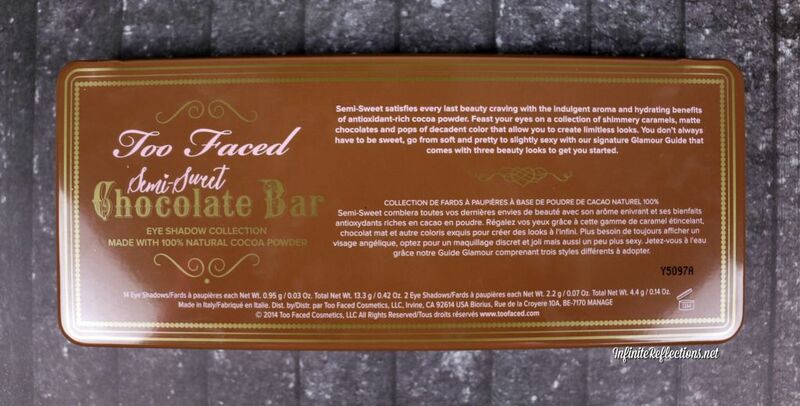 Both palettes have the signature chocolate-y scent when you open them, almost encouraging you to take a bite. Apparently, they do also taste like cocoa, although I have never tried so have no means to confirm this. 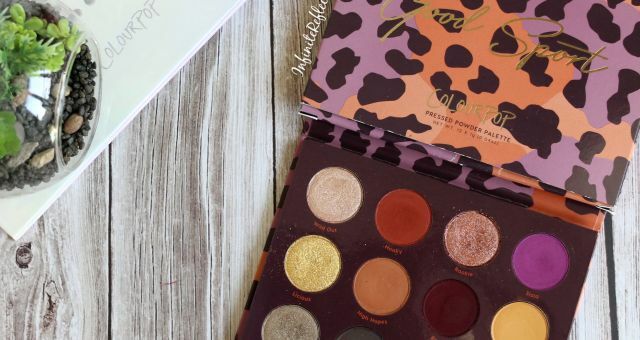 Love the packaging and feel of both the palettes, feels very sturdy yet sleek, compact and travel friendly. Some pictures below of the specifications and other technical details. Now, let’s jump into the comparison. 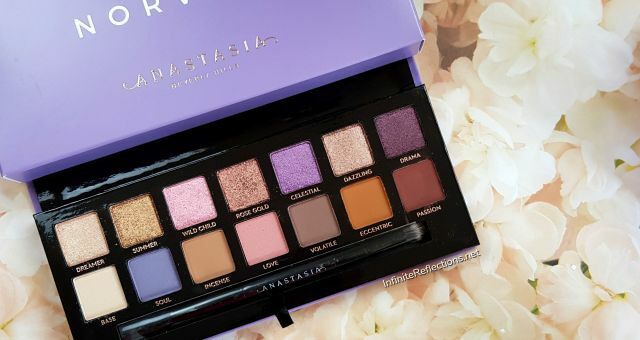 I have to be honest, after trying the newer palettes like the Anastasia Beverly Hills Modern Renaissance palette, the shadows in both of these palette do feel a bit stiff on the pan. The texture is not buttery soft for all the shadows, but only for few of them. The shimmers don’t feel smooth, in fact, the shimmers of the semi sweet palette seem to be more smoother and softer to the touch. Having said that, the shadows by no means feel poorly pigmented or anything like that. The brush pickup, colour payoff and pigmentation of the shadows are great (well barring maybe few). Since, the shadows are not extremely soft, there is almost no powdery kick off when a brush is dipped in the shadows. So, they are quite easy to work with and I haven’t noticed much of a fallout. 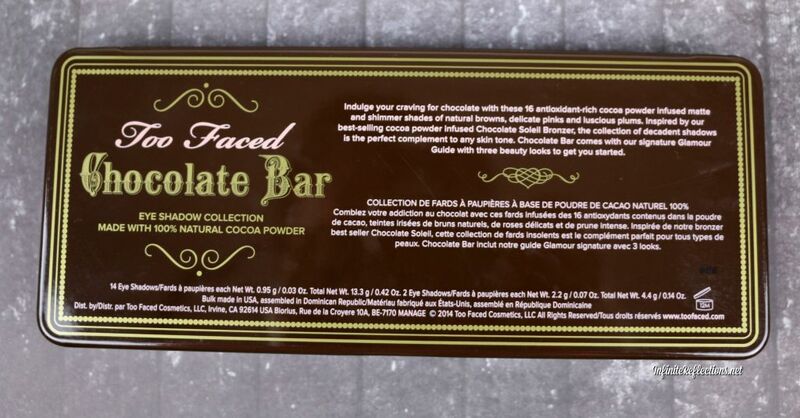 Smooth Texture Shadows -> White Chocolate, Milk Chocolate, Salted Caramel, Marzipan, Hazelnut, Champagne Truffle. Fairly smooth -> Gilded Ganache, Triple Fudge, Semi-sweet, Strawberry Bon Bon, Amaretto, Crème Brulee, Haute Chocolate, Cherry Cordial. Rest of the shadows have some feeling of grittiness when touched in the pan and are not very smooth and soft in texture. 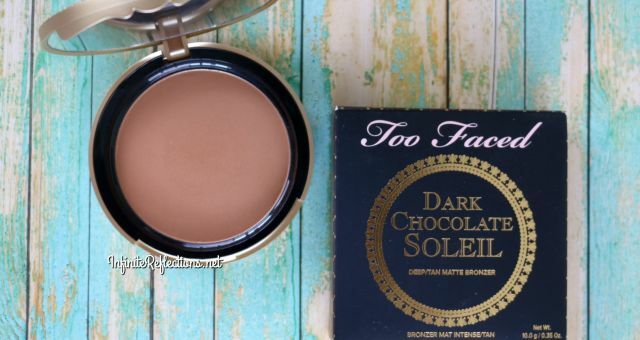 Smooth Texture Shadows -> Licorice, Coconut Crème, Nougat, Truffled, Cocoa Chili, Puddin’, Peanut Butter, Frosting, Rum Raisin, Mousse, Caramel, Bon Bon, Butter Pecan. 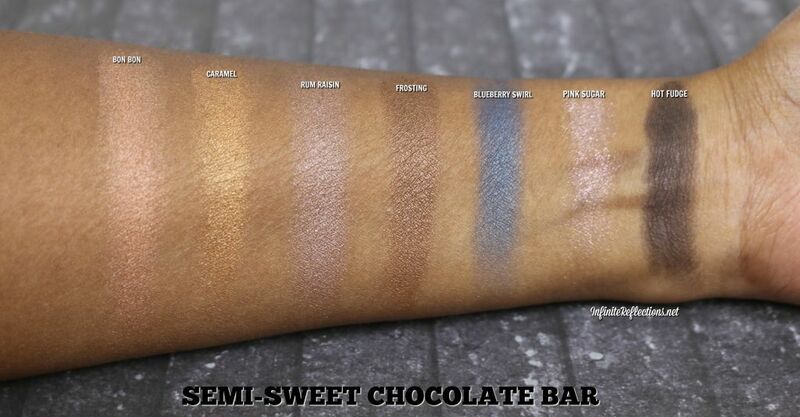 It is pretty clear that the semi-sweet version has shadows which are much more softer in texture. 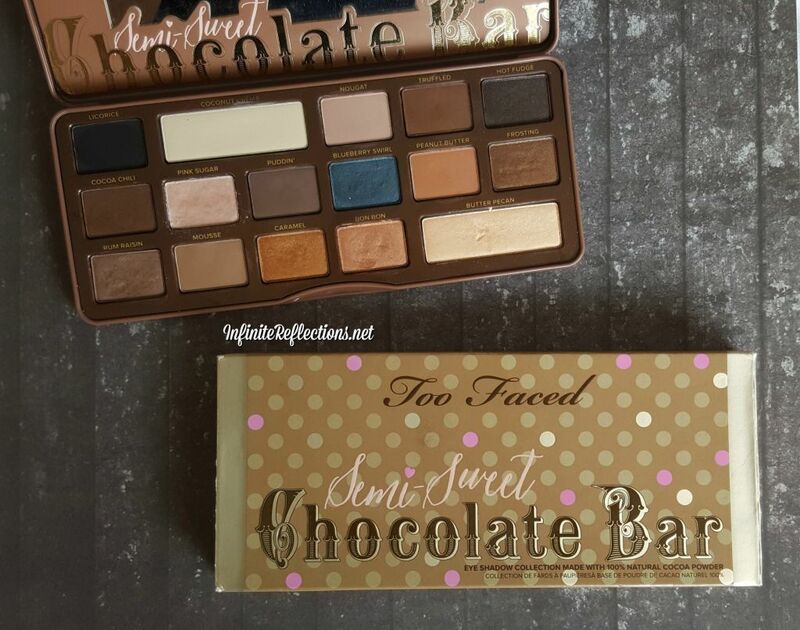 I find both palettes have very good pigmentation and colour payoff. All the shadows are pretty easy to work with and they blend really nicely. 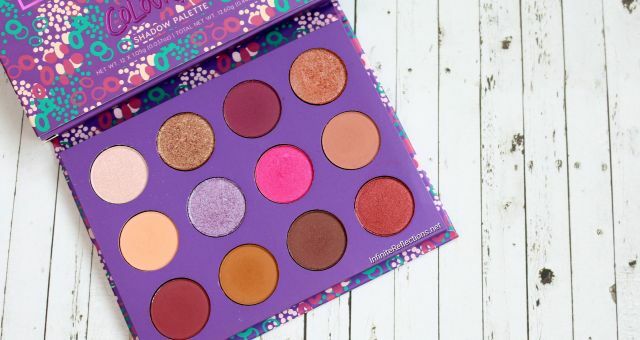 The matte shades of both the palettes are pretty nice but the semi sweet version has more softer shades and its consistency and pigmentation is a tiny bit better. 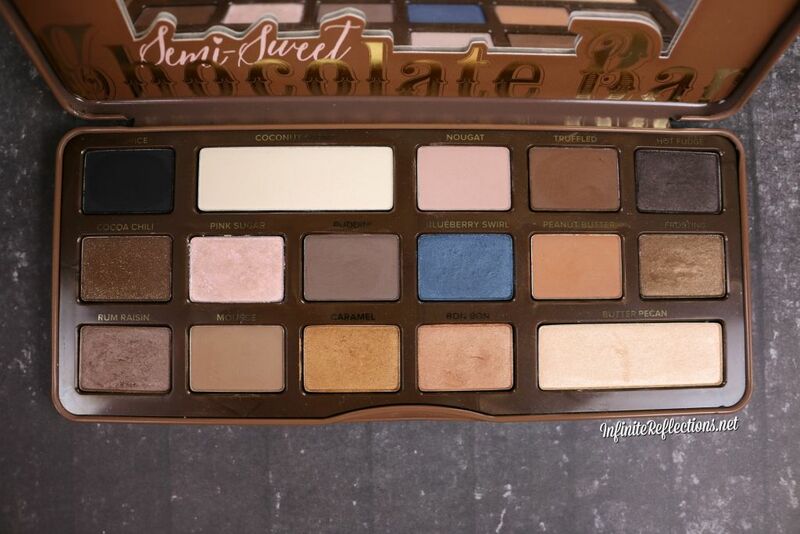 The semi sweet version also has a black matte which is so important and is missing from the original palette. 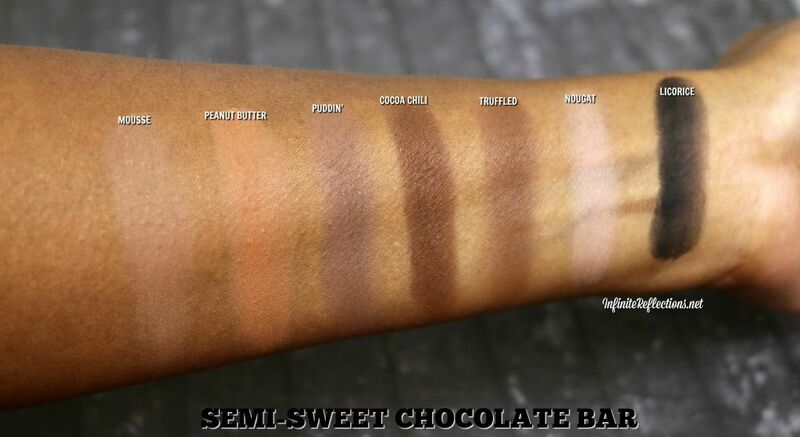 I also love the warmer browns of the palette, which is the kind of shades I gravitate towards for everyday looks. 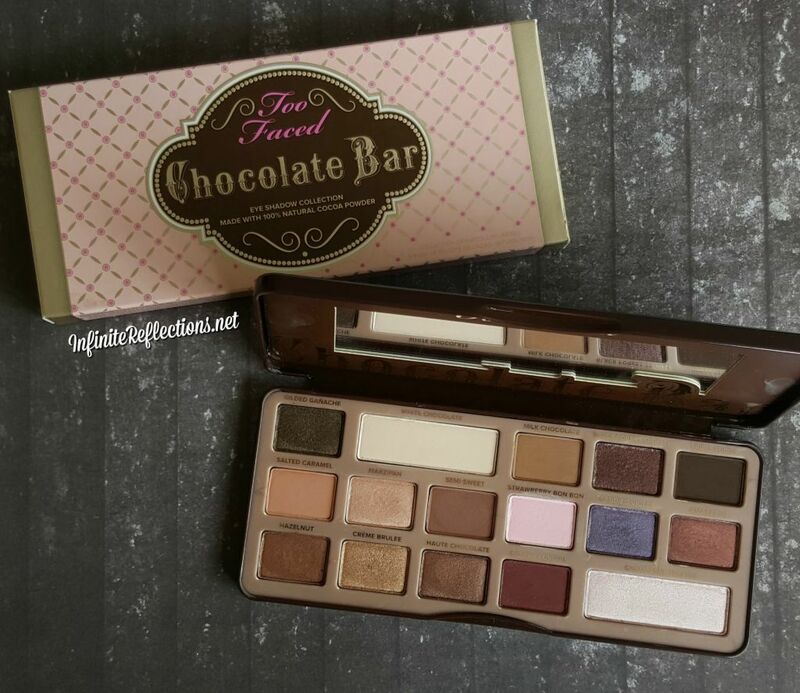 I love the shade Triple Fudge from the Chocolate bar palette and it provides a nice versatility to the palette. 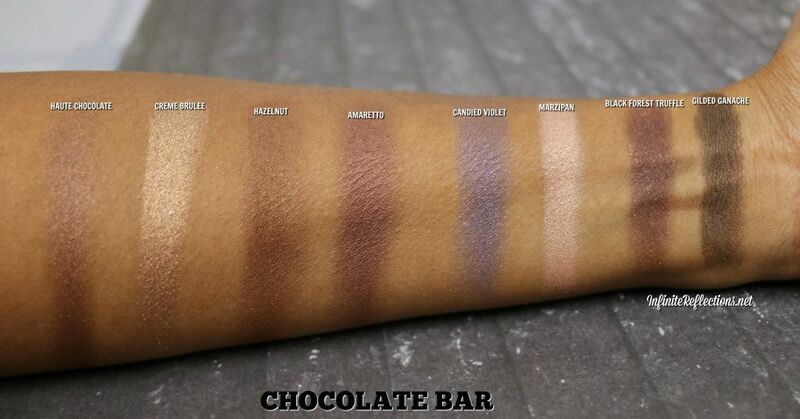 The other mattes are also nice but I feel that a nice warm brown is missing which would have been awesome. 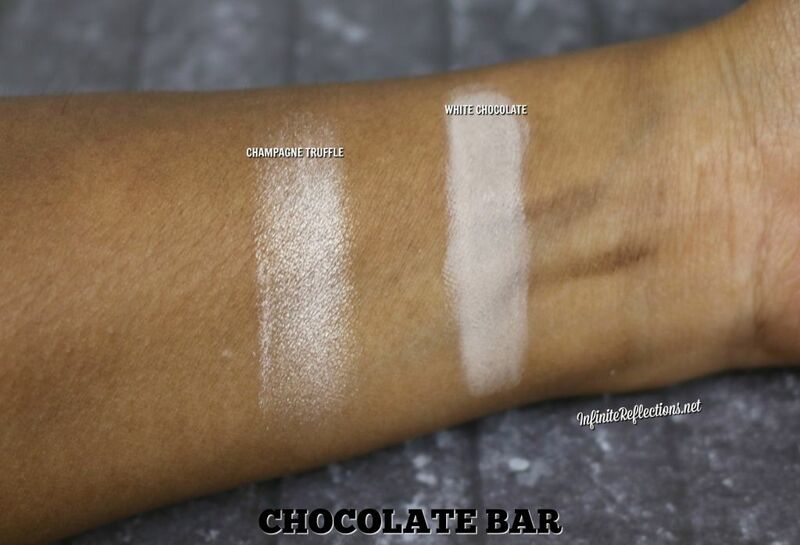 There isn’t much you will be able to do with these mattes if you have a more deeper skin tone. 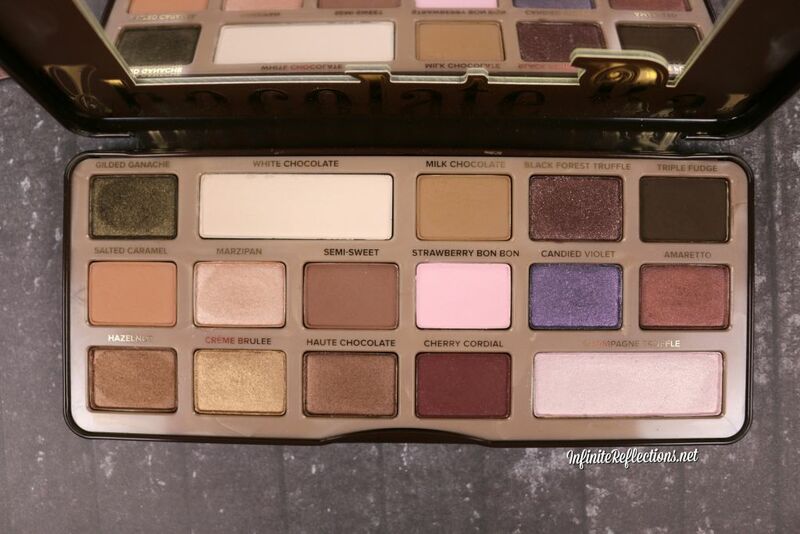 This is where the chocolate bar palette could win more points if you like intense shimmer shades. They may not feel buttery soft, but they have amazing pigmentation, colour payoff and intensity. 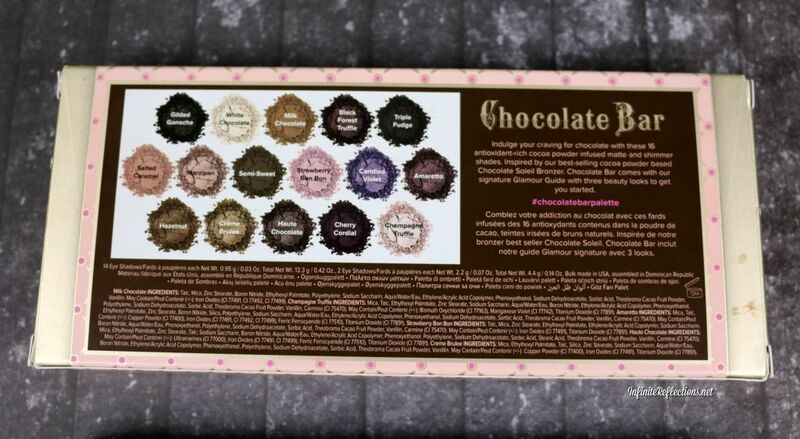 “Gilded ganache” and “Black forest truffle”, which have tiny shimmers in them, feel a bit chalky and gritty and “Candied Violet” has average colour payoff, which is bit of a letdown. But, the rest of the shimmers are amazing. They are so beautiful and I love them. The shimmers in the semi sweet version are also pretty nice but they appear a bit toned down and subtle (specially on deeper skin tone). I really love these shimmers also and are perfect for a subtle look and most are much softer than the original version. “Hot Fudge” is almost a matte with shimmer but the chalkiness is quite less. “Blueberry swirl” and “Pink frosting” are quite a let down. They have poor pigmentation and colour payoff and will have to be used wet to get any kind of payoff. Although, “pink sugar” applied wet to the eyelids, is really very pretty, sort of like an iridescent pink shade. The rest of the shimmers have pretty good pigmentation and colour payoff on their own. The highlight shades in both the palettes are pretty good. They are very well pigmented, soft and easy to work with. 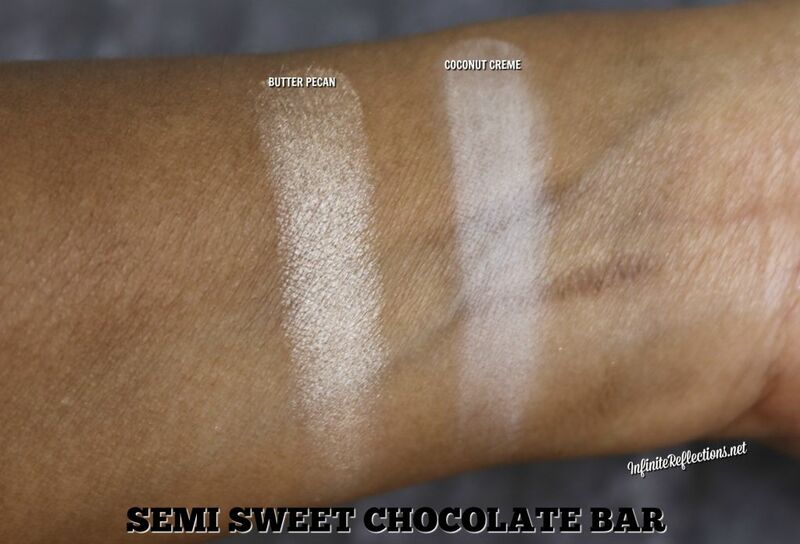 However, for my deeper skin tone the highlight shades of semi sweet version work a slight bit better as both of them are more yellow toned. 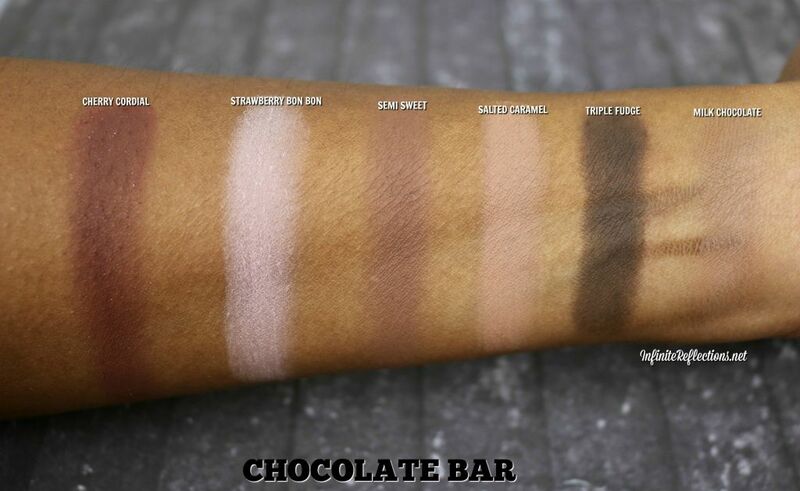 To sum it up, I love both the palettes but I gravitate more towards the Semi Sweet Chocolate Bar palette since for deep skin tone it seems to be a more versatile palette and easy to work with for day to day looks. 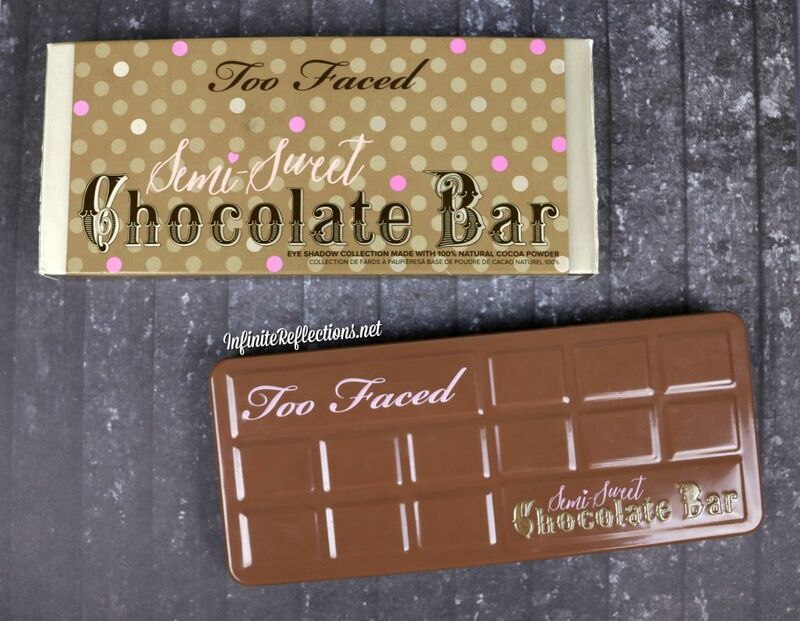 I use the Chocolate Bar palette if I want to go that extra bit to create a more glam look. But, this again is my personal choice. 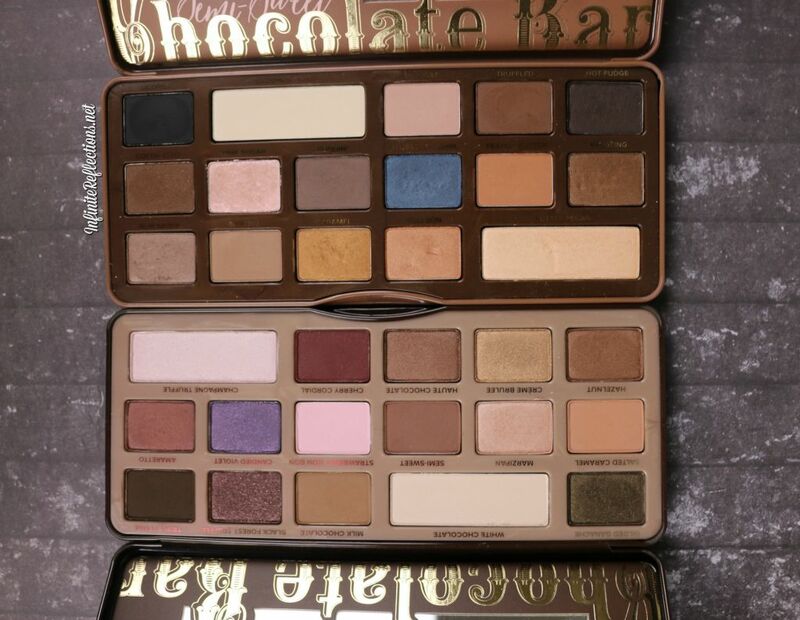 Both, the palettes are good and have their own place. I hope this review was helpful. I would really like to know which one do you prefer?